Almost every oral health issue is a progressive condition. That means that the condition will only get worse over time until you treat it. In some cases, this timeline can be the difference between saving your tooth and losing it. Gum disease is a serious oral health concern. If you notice the signs of gum disease, you need to start managing the condition immediately. When you treat gum disease, you can reverse the condition. However, if the condition evolves beyond repair, you could end up losing your tooth. The first stage of gum disease is gingivitis. This is a condition you hear referenced in advertisements for toothpaste or toothbrushes. Gingivitis is characterized by chronic inflammation of the gums. You’ll notice spots on your gums are red and hurt when touched. These are telltale signs of gum disease, and you should speak to your dentist right away. If you fail to treat gum disease, the condition will eventually become periodontitis. Once you develop periodontitis, you cannot reverse the condition; you can only manage it. That’s why early detection and treatment are so important. What Happens to My Teeth When I Have Gum Disease? You develop gum disease when bacteria build up around and beneath the gum line. These bacteria can form a film on your tooth’s surface, and far below your gums. That bacteria will begin eating away at the connective tissue between your tooth and your jaw bone. This connective tissue can grow back over time, but once the bacteria start eating away at your jaw bone, this cannot be reversed. That condition is known as periodontitis. Your jaw bone can begin to lose mass. This causes the surrounding teeth to become loose, and eventually they can fall out. To treat gum disease or to manage periodontitis, your dentist will use a treatment called “scaling and root planing.” Scaling is a process by which your dentist carefully accesses your tooth roots and removes the bacterial buildup from them. After your dentist does this, he or she will plane your roots, smoothing them out so that no bacteria can hide in the grooves left behind by infection. 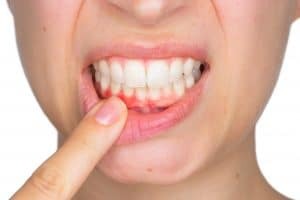 This treatment method is an effective way to treat gum disease, and it’s a necessary treatment to keep periodontitis from causing tooth loss. If notice any of the signs of gum disease, contact your dentist right away and inquire about treatment. Greenhaven Family Dental offers scaling and root planing treatment to help you eliminate gum disease. Schedule an appointment with Greenhaven Family Dental in Baxter, MN by calling 218-454-0523.